This week, social networking site MyYearbook launched a revamped design, changing some key UI elements to better reflect the way people use the site. One of the more interesting points of the redesign isn’t its appearance though — it’s how it was actually put together. Rather than simply rolling out a new design, MyYearbook actually polled its userbase for suggestions, then drafted some mockups that users voted on. The result? Users favor the new design by a factor of over 3 to 1, without the kind of backlash other sites have seen from their redesigns. The most obvious change to the site is the logo, which has gone from cartoony to something a little more professional (though it still has a couple of smiley faces). The navigation bar has also been simplified. CEO Geoff Cook says that over time MyYearBook had integrated a bunch of gaming menu options into the main navigation area, without doing much to differentiate the core features that actually make the site a social network. Now, they’ve been moved to a different section of the header. This is actually only Phase I of a two-part change; soon MyYearBook will be modifying profile pages to more prominently feature Chatter streams. A Chatter stream looks visually similar to Facebook’s News Feed, but features a more heavy emphasis on meeting new people rather than only seeing content from your friends. The default Chatter feed displays recent content updates from other users in your vicinity (assuming you’ve told MyYearbook where you are), and there are tabs to see updates from just your friends. Because MyYearBook is a social network, it obviously knows some key demographic information about each of its users. With that in hand, the site pulled together some interesting data analyzing exactly which members were in favor of the new design, and which ones weren’t. The conclusion? 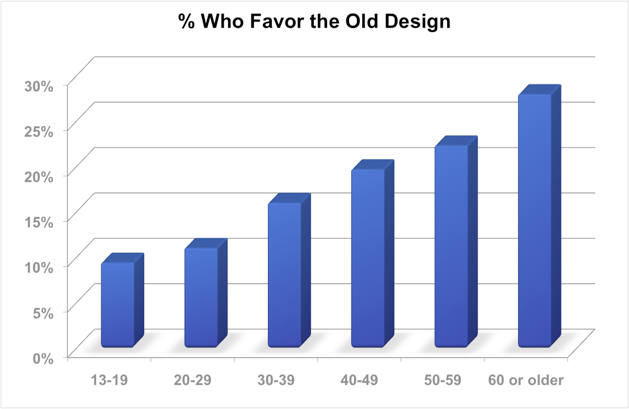 While the new design was favored over the new design by over 3 to 1 when averaged across all members polled, there was an obvious trend when age was taken into consideration: the older the user was, the more averse they were to the new design. That may not be especially surprising, but it’s interesting to see just how consistent the graph below is.